I've done it! 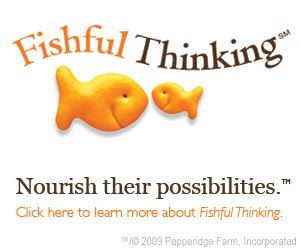 I've signed up for Fishful Thinking! You've heard of Fishful Thinking, right? Everybody's doing it! and can confidently tackle life’s challenges. Optimism: Focusing on the positive things in life. Emotional Awareness: Expressing and controlling your feelings. Goal Setting/ Hope: Finding ways to achieve your goals. Resilience: Coping with life’s ups and downs. Empowerment: Identifying and using your strengths and skills. There are a bunch of activities you and your children can do on the site as well as a quiz that you can take to find out how resilient your child is! This is a great site that fosters a positive outlook on life and will also strengthen your relationship with your children! I'm going to get my son to explore the site with me very shortly! I urge you to stop by Fishful Thinking and jump right in to the activities! I'm a fan of Fishful Thinking too - lots of great stuff on their website. Thank you for your comments earlier today! !